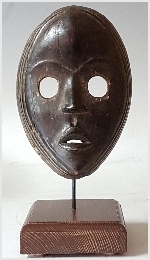 African mask with pointed chin, perch lips slightly open, conical nose leading to both eyebrows with circular eyes and gently sloping forehead. Distinct carvings on each side of the face. Dark and shinypatina. Pierced at the perimeter for attachment.